BORATE TREATMENT - "We kill what bugs you!" Another form of termite treatment is what is known as a borate treatment. This treatment is done once the framing and exterior walls have been put up. Borate treatments are also effective for preventing other types of wood destroying insects. Borate is a mineral mined from the earth, with about half the worlds supply being mined from a spot near Death Valley Natural Park. Borates are a great natural pesticide and wood preserver. Borate is quickly absorbed into the wood and will provide long term protection against wood destroying insects. Often as seen above, a green or blue dye is added to the tank mixture to help the applicator make a thorough treatment. This form of treatment is a good choice for someone who wants protection from termites but has already passed the initial stage of pouring a foundation. 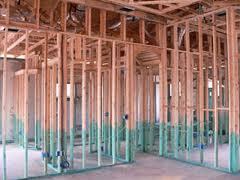 Call us and schedule a free on site consultation and estimate, we would love to hear from you.